Delta Dental of Arizona Foundation is going on the road! Learn more about our community grants program at an upcoming workshop! 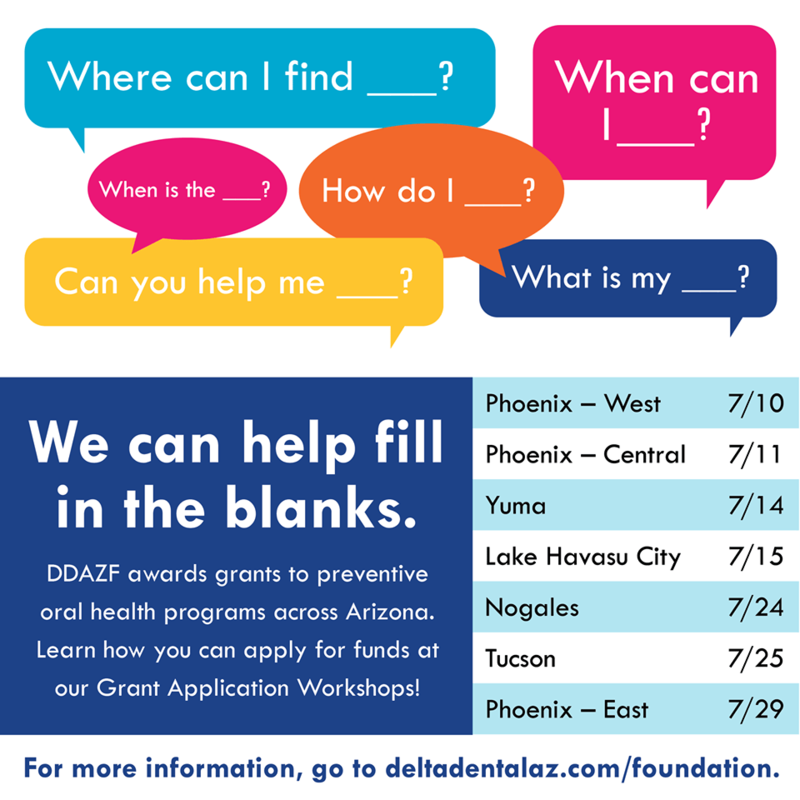 The Delta Dental of Arizona Foundation is pleased to announce the opening of its 2015 community grants program, which provides funding to organizations helping to improve the oral health of Arizonans.Organizations have until September 4, 2014 to apply for one, two or three-year grants ranging from $1,000 to $25,000 to support oral health promotion and dental disease prevention and education programs. The Foundation will consider a wide range of preventive and educational oral health programs for families throughout Arizona. If you don’t qualify for these grant then take a look at this useful list of small business grants. Phoenix West: 11 a.m. – 1 p.m., Thurs., July 10 at the Delta Dental of Arizona Foundation, 5656 W. Talavi Blvd. Phoenix Central: 9:45 a.m. – 11:15 a.m., Fri., July 11 at Burton Barr Library, 1221 N. Central Ave.
Yuma: 12 p.m. – 2 p.m., Mon., July 14 at the Yuma Community Food Bank, 2404 E. 24th St.
Phoenix East: 11 a.m. – 1 p.m., Tues. July 25 at the Boys and Girls Club of the East Valley, 300 E. Chandler Blvd. A number of workshops may be accessed via conference call* at 866-910-4857, passcode 805209. Please make a reservation to attend, whether in person or conference call, by contacting Judy A. White RDH, MPH at jwhite@deltadentalaz.com or at 602-588-3923. For a list of past grant recipients, complete guidelines and application materials, visit: www.deltadentalaz.com/foundation/community-grants/index.asp. ← Dentist By 1: When Should Your Child First Visit the Dentist?